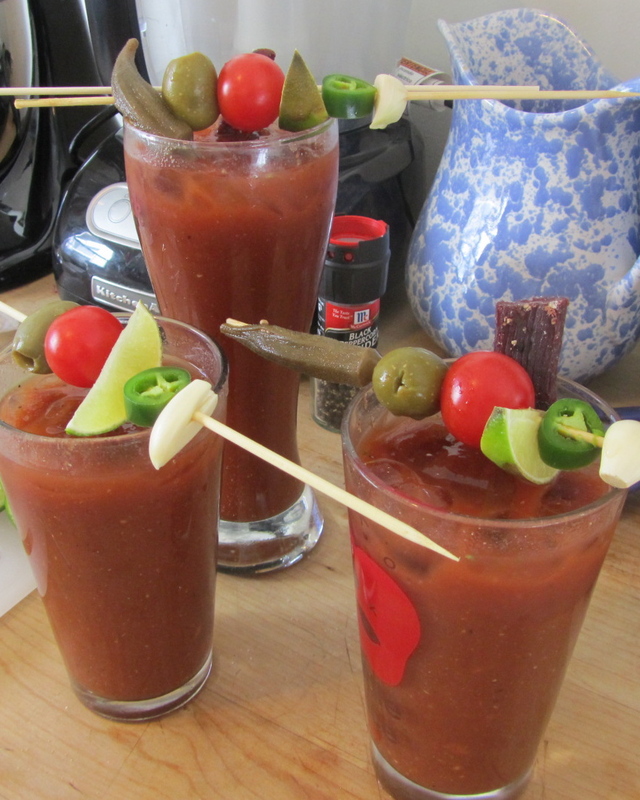 There is nothing as fun as Bloody Marys for breakfast on a lazy Sunday. Last weekend, our friends Lindsey and Trevor came over for football…and whenever football is on, I feel the need to start cooking (What can I say, I don’t like to watch football and I love to feed people!). I like my Bloody Marys fancy and spicy. Since we were entertaining, I made these fancy skewers that worked amazingly as stir sticks. They kept the spices from settling at the bottom, and infused the juice with extra garlic, jalapeno, and lime kick. Have fun with these! Stir all the spices together, then add 2 oz of vodka. Fill glass halfway with ice and top with tomato juice or V8 (I prefer low sodium). 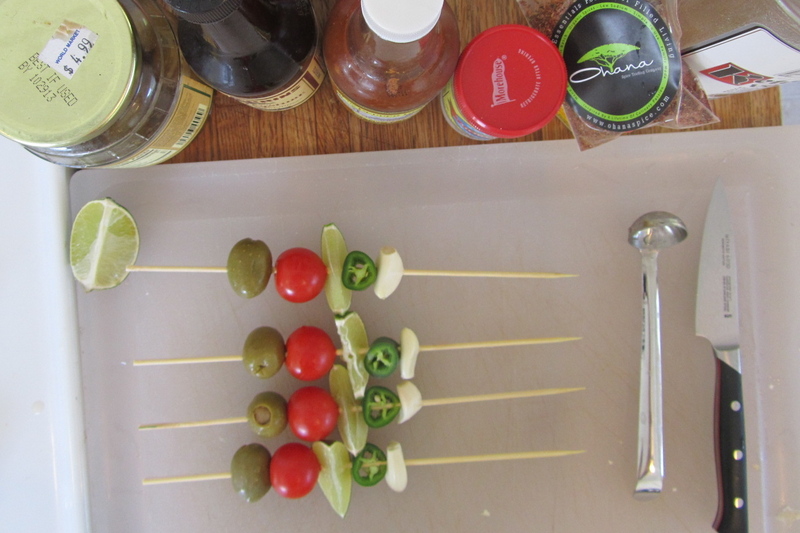 For the skewer stir sticks, I speared a blue cheese olive, cherry tomato, lime wedge, jalapeno slice, and garlic clove (and pickled okra for those who like it) on a long BBQ skewer. These aren’t necessary, but add a lot to the presentation (another option is to skewer a couple olives with a toothpick). Tim also likes to use quality beef jerky (like Ray’s Own Brand) as a stir stick. This entry was posted in cocktails, Sweet Life Laur Original, vegetables and tagged bloody mary, spicy by Laura Zolnoski. Bookmark the permalink.